Garmin has officially unveiled the Forerunner 935, its latest GPS sports watch that's built for triathletes. Sitting at the top of the Forerunner family above the Forerunner 735XT and Forerunner 235 watches, it's built for serious athletes and packs in new training features that have already cropped up in Garmin's Fenix 5 collection. Until we get our hands on one for a full review, here's a breakdown of all the key features you can expect to see from the new Garmin Forerunner 935. Following in the footsteps of Garmin's latest Forerunner watches, this circular shaped watch has physical controls only making it easier to check in on your data when your fingers are a little sweaty. The 935 weighs just 49g and measures in at 13.9mm thick, so it's by no means a bulky watch. It also features a fiber-reinforced polymer watch case and bezel to help it withstand some rough and tumble. The waterproof design means you can take it for a dip up to 50 metres as well. It's currently only available in black but you can swap out the silicone watch bands for something more luxurious like a leather or metal one if you don't fancy wearing a sweaty strap in between workouts. In the display department there a 1.2-inch 240 x 240 transflective display to aid visibility in the bright outdoors. It's not going to be the sharpest or the brightest of displays, but it's certainly going to be a lot kinder to the battery. 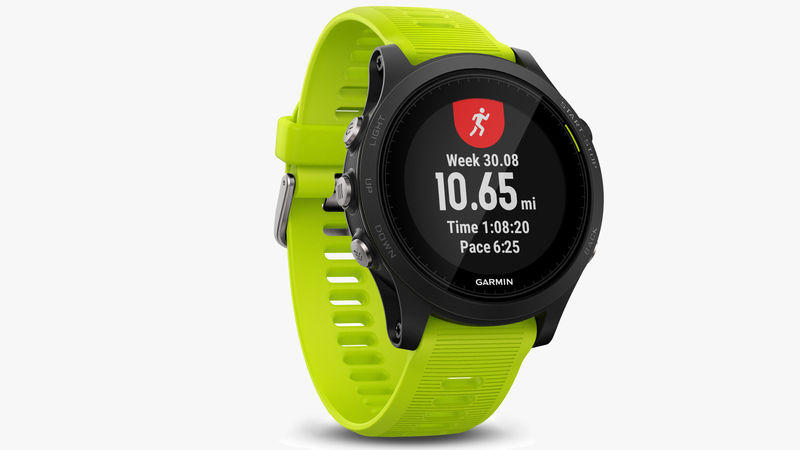 Building on the features included in the Fenix 5, Garmin is pushing the emphasis on multisport tracking so you can also record hikes, trail runs, skiing, paddle sports, golf and more. Unsurprisingly, it's packed with sensors including an altimeter, accelerometer (for indoor tracking), thermometer and compass. It'll also have GPS/GLONASS support for tracking and Garmin's own Elevate heart rate sensor so you can ditch the chest strap. Aside from that, you'll find the usual Garmin fitness tracking skills from the Vivosmart HR+ and Vivofit 3 trackers. So there's sleep monitoring, the motivational Move Bar and elevation for when you swap the lift for the stairs at work. It'll also be able to see the effects of training so you know when you need to take a break. That's powered by the folks at Firstbeat Analytics adding modes like Training status, Training load and training effect metric already included on the Fenix 5. If you've got the 735XT, these are the features you are missing out on. There's plenty of dedicated metrics for swimming and cyclists that we've seen crop up on older Garmin watches plus compatibility with Varia cycling accessories and pedal-based power meters. It'll work of course with Garmin's smart scales to track body composition data. Along with the new watch, there's also a new Running Dynamics Pod that clips onto the waistband and is able to deliver six running dynamics including cadence, ground contact time, stride length and more. Additional metrics for cycling and swimming are also on offer and the Pod will cost you $69.99. Data is still synced with Garmin's continuously improving Connect platform where you can view access modes like GroupTrack to see how your performances compares to other Garmin users and LiveTrack so people can follow you out during run, rides and races. You'll have access to the Connect IQ store as well to download additional apps and data fields to use on the watch. On the apps front, Garmin is pre-installing the TrainingPeaks app allowing users to download free workouts directly to their watch and there's Strava Live Segments support as well. Garmin's great smartwatch features are in tow including notification support, the ability to control music playback and create your own custom watch faces. In terms of battery life, the Forerunner 935 will apparently serve up 24 hours in GPS mode and up to 60 hours in UltraTrac battery saver mode. In watch mode, it'll be good for two weeks before you need to power it up again. That's pretty much in line with what you can expect from Garmin's other multisport GPS watches including the Fenix 5 and the 735XT. The Forerunner 935 is available for $499.99 and is also available in a tri-bundle for $649.99, which includes a a black watch face with yellow strap, HRM-Tri, HRM-Swim, and additional straps. Garmin is also offering a 60-day trial of Strava Premium if you decide to part with your cash. It's set to go on sale in the second quarter of 2017, so should land some time before June 2017. To put that price into perspective of the other big Garmin's currently up for grabs, the Fenix 5 is priced at $599.99, so it's cheaper than the new Fenix. The triathlon training-friendly 735XT currently costs $449.99, so it's pricier than the watch we scored a big 9 out of 10 in our comprehensive review. Are you thinking about snapping up the Forerunner 935? Do you have any more questions about the GPS sports watch? Let us know in the comments below.